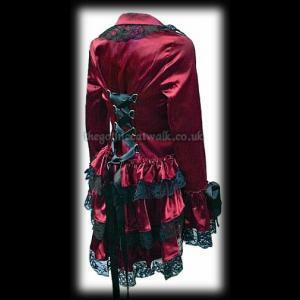 A spectacular gothic burlesque corset jacket made from top quality rich dark red satin with metal D rings and black satin ribbon corset lacing at the back which is fully adjustable to ensure a custom fit. 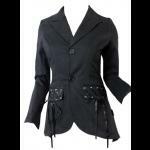 The front of the jacket has a button fastening and a peplum trimmed with black lace. 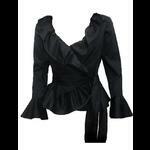 The back of the jacket is longer than the front and the triple satin laced-edged frill forms the bustle effect. 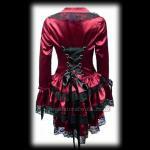 Black lace also trims the collar and the flared frilled cuffs. A black ribbon bow also trims each sleeve cuff. Fully lined. 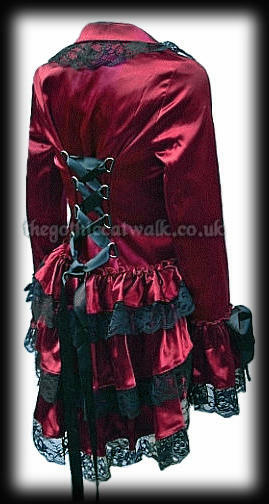 This is a truly gorgeous jacket with loads of drama and major wow factor. 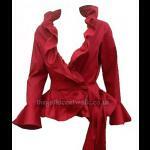 Bust: 34" Length to side: 28" Length from collar to back hem: 37" Sleeve from underarm: 20"